The past couple of months have been very much makeup free with lots of attention to improving my skin. I’ve found a skincare routine that really seems to work for me (I shared the details in this post), but I’m always on the hunt for great skincare that makes my routine even better for my skin. Oskia has been in the limelight for a while when it comes to the beauty blogging scene, and I can’t believe it took me so long to finally invest in a couple of products to try out. I’ve been using this duo for a couple of months now and I really am noticing the difference, so I wanted to dedicate a post sharing these two gems. Most of you probably know it by now, but I’ll take a moment to talk about my skin type: I have dry, acne prone skin – the peskiest of skin types! It’s taken years for me to establish a routine that doesn’t aggravate my skin, and find products that hydrate my complexion without clogging up my pores. The Oskia Renaissance Cleansing Gel has been spoken about far and wide by bloggers everywhere. It has been named a cult product which works for most skin types, nourishing and cleansing at the same time – and it does just that. I love the scent, it smells very spa-like which I’m all for. The formula itself isn’t heavy, but it isn’t too light either. It lathers up and washes off beautifully, and my skin doesn’t feel taught after using which makes it such a game-changer. I love to pair this with my Oskia Restoration Oil, a more recent Oskia purchase, which was definitely more of a splurge for me. However, I use about two drops each night and the jar is quite large and full, so I can see it lasting a really long time. I apply this oil between my toner and moisturiser for an extra moisture boost. It also heals any pigmentation marks and improves the overall texture of my skin. I’ve only been using it for about two months but I’m already noticing such a difference – and now I can’t go back to not using an oil in my nighttime routine! 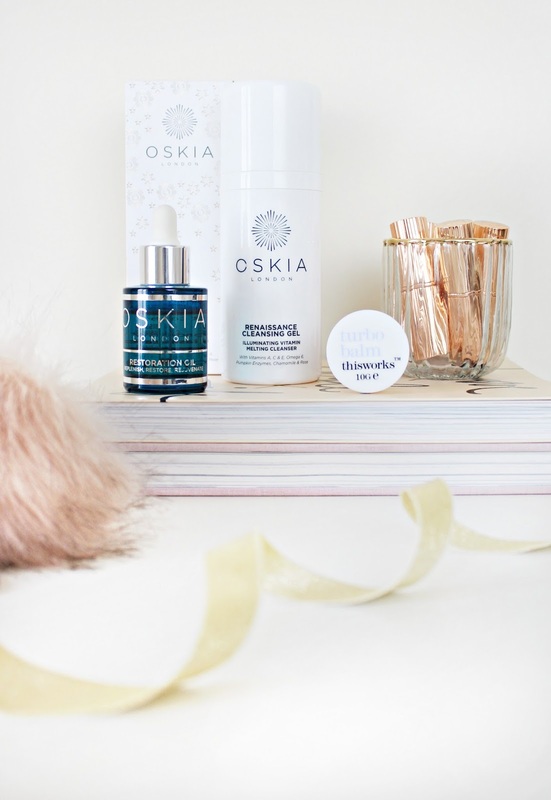 So this is the duo that I’ve been loving from Oskia – and I’m keen to try out more from the brand soon! Previous Post My Summer Homeware Wishlist.